Antony Woodward is, without a doubt, one of life’s dreamers. But, unlike most dreamers, he had the courage (if that’s the right word) to get out there and turn his dream into reality. Finding himself the new owner of Tair-Ffynnon, a rocky five acre smallholding high in the Welsh mountains, he did what any sensible person in his position would do. He decided to build a garden. And not just any garden. One sufficiently cultured and awe-inspiring to be admitted into the elite ‘yellow book’ of the National Gardens Scheme. 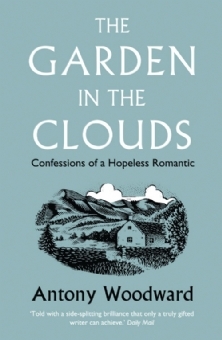 The Garden in the Clouds is the story of how Woodward and his growing family turned this unpromising heap of rocks in to a garden and a home. But more than that, it’s a story about how our childhood and our families shape our lives. And about how we can become so hopelessly captured by love for a place that all logic goes out of the window. Woodward regales us with stories of temperamental tractors, vaulting sheep and huge lorries on tiny dirt tracks. He catalogues the trials and tribulations of high winds, torrential rain and the intricacies of getting planning permission for a railway carriage. And he shows us how a family, working together, can achieve pretty much anything. As with many books like this, the financing of the venture inevitably involves the fruits of a high-flying city career and the sale of (and I’m guessing a little here) a property in London that had fared well in terms of house price inflation. Which is a little annoying for those of us who don’t happen to own a four-bed mews house in Notting Hill that we bought for 50p ten years ago and which is now worth a cool half a million. This entry was posted in Books and tagged Antony Woodward, Books, The Garden in the Clouds by Simon Perks. Bookmark the permalink.